Non show fee: 100% of the remaining accommodation balance. Early departure: 50% of the remaining accommodation balance. Contact the hotel in order to arrange key collection. The rooms are situated in a beautiful piece of land surrounded by lovely gardens and are always bathed in abundant light. 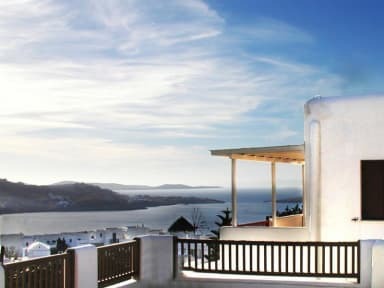 It is the definite quite place to relax while being in the heart of Mykonos life. Loukas Pension consists of 13 beautiful rooms, most of them with private balcony from which you can enjoy Mykonos town, the Aegean sea and the sunset! All rooms are bright and offer an LCD TV, free Wi-Fi and fridge. Featuring light wood furnishings and tiled floors, each has a private bathroom with shower.